Magnetic refrigeration based on the magnetocaloric effect is one of the best alternatives to compete with vapor-compression technology. Despite being already in its technology transfer stage, there is still room for optimization, namely, on the magnetic responses of the magnetocaloric material. In parallel, the demand for different magnetostrictive materials has been greatly enhanced due to the wide and innovative range of technologies that emerged in the last years (from structural evaluation to straintronics fields). 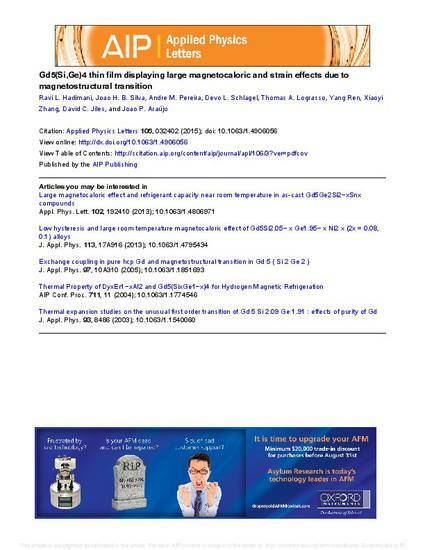 In particular, the Gd5(Six Ge1−x)4 compounds are a family of well-known alloys that present both giant magnetocaloric and colossal magnetostriction effects. Despite their remarkable properties, very few reports have been dedicated to the nanostructuring of these materials: here, we report a ∼800 nm Gd5Si2.7Ge 1.3 thin film. The magnetic and structural investigation revealed that the film undergoes a first order magnetostructural transition and as a consequence exhibits large magnetocaloric effect (−ΔSmMAX ∼ 8.83 J kg−1 K−1, ΔH = 5T) and giant thermal expansion (12000 p.p.m). The thin filmpresents a broader magnetic response in comparison with the bulk compound, which results in a beneficial magnetic hysteresis reduction. The ΔSmMAX exhibited by the Gd5(Si,Ge)4 thin filmmakes it a promising candidate for micro/nano magnetic refrigeration area. The following article appeared in Appl. Phys. Lett. 106, 032402 (2015) and may be found at http://dx.doi.org/10.1063/1.4906056.